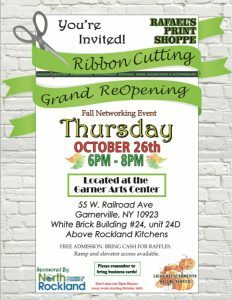 Ribbon Cutting Ceremony: Rafael’s Print Shop at Garner Arts! Come out and join the Chamber in welcoming Rafael’s Print Shop to Garner Arts Center in Garnerville! We are proud to welcome them as a member of the Chamber and chose to be a member of our community by moving their business here! Refreshments will be serviced. Come see this open space and preview their work!